Reservations are mandatory-seating extremely limited! ​First Thursday is a lively night with music, food trucks...and now theater! A series of satirical short plays, woven together by a modern day vaudevillian master-of-ceremonies who counsels audience members on how to lose your job! The perfect night out for anyone who’s ever had a bad day. These delightful, engaging, surprising stories celebrate the tenacity of the human spirit. 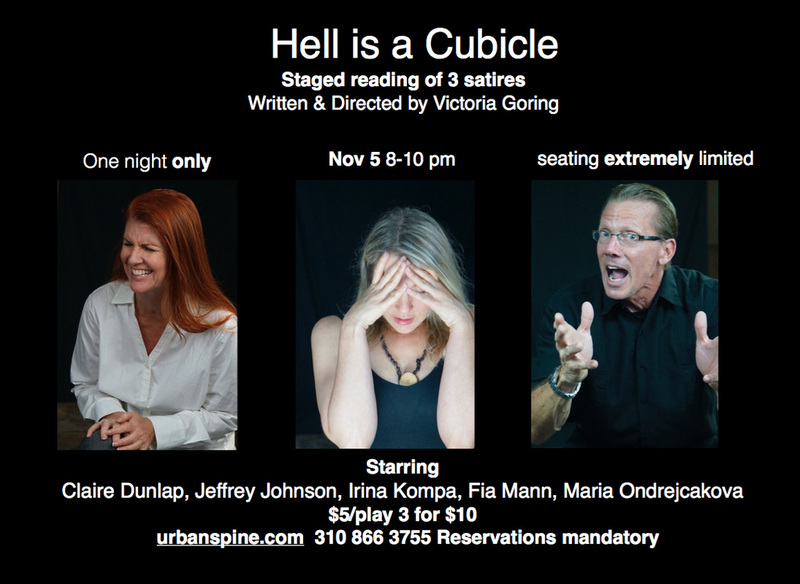 Hell is a Cubicle and other stories is a necessary exploration of the bureaucratic insanity our society is tangled in. These plays reflect the daily frustration consumers have when dealing with ridiculous policies; the doubts philosophers have at finding meaning in this increasingly homogenous culture; the despair the lonely have at connecting on a personal level. Hell Is a cubicle and other stories are frustrating, yet redemptive. Hope and success comes in many surprising places: Humans mange to connect; employees of menial jobs find a way to add interest to their jobs, and humour abounds.